Great Atmosphere For Great Coffee. Bring your tablet or laptop, plug into one of the myriad of outlets and enjoy our crazy fast internet. Relax, sip, and contemplate the deep delicious complexities of your Vanilla Bean Breve. Enjoy our simple and modern decor, with warm hints of a vintage coffee house as you re-connect with friends and share life together. Whatever your plans, they can fit here just fine. 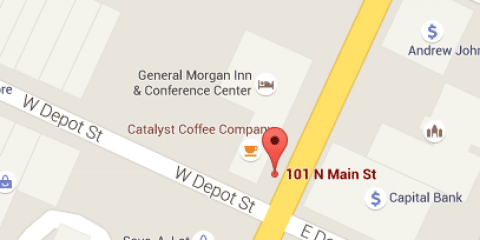 Catalyst Coffee Company is passionately committed to amazing coffee in a warm and inviting coffee shop culture. The Mission of Catalyst Coffee Company is not just about serving amazing coffee. It’s about a place for people to meet and connect, enjoy great coffee and be a “catalyst” to the revitalization of downtown Greeneville, TN. With every cup of coffee you purchase, you’re helping us pour back into our downtown community. Every item you purchase is not only guaranteed to be fantastic, but also puts money into the hands of those doing effective good in our city, region and beyond. 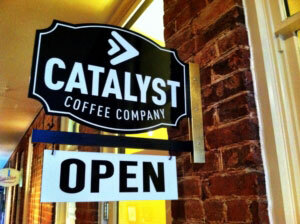 Catalyst Coffee Company. LOVE GOD love people Love Coffee. Our coffees are sourced directly from the coffee farmers at “the farm gates.” the prices paid for the “Farm Gate” coffees we buy are guaranteed to benefit the coffee farmers 50-100% over the prices paid for “Fair Trade” coffees. This not only gives the hard working farmers more reward for their work, but also guarantees us the highest quality, and freshest coffee possible.